caption: © Pierre Gonnord, “Ali” 148 x 125 cm. Color photograph under plexiglass, framed. I’ve had this portrait hovering in my desktop since November. From then on, I kept avoiding identifying the author and seeing further work, already suspecting my enthusiasm would be cut to shreds. It was and it wasn’t. I’m clearly not the public for Pierre Gonnord‘s (b. France, 1963) work. I don’t like it. Don’t think it’s only a matter of taste (I think his overall aesthetic is too shinny, too caricatural, too technical, too tautological… it feels like excessive), but am still not sure about the ethical premise. 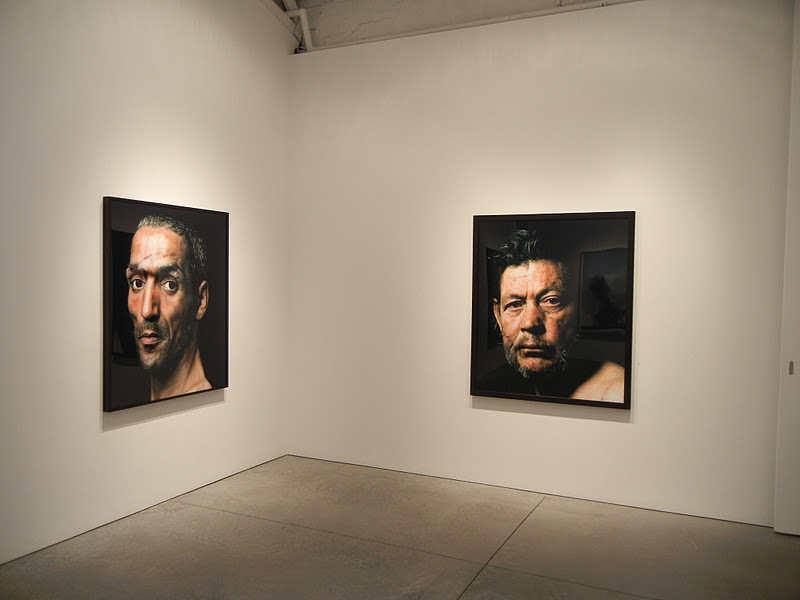 When Gonnord exhibited some of his work (a series entitled Relatos) in New York, at Hasted Kraeutler, in 2015, some of the portraits displayed were of gypsies who live in the south of portugal. It sparked some debate here. I’d say the main issue is the clash between the dignity these people are given in these portraits and the reality of their lives – how they are treated by portuguese authorities, etc. installation view at Hasted Kraeutler, New York, 2015. Some of the portraits manage to escape this framework (of doubtful aesthetic and ethical intentions) and strike me. I don’t know how and why this happens, but I’m convinced it has something to do with empathy and recognition, with seeing in that other’s portrait something essential and universal about our condition. It also reminds me a bit of the feeling I have facing some of Nebreda’s portraits: an uncanny sensation of knowing who the other is, what his/her pains are. Gonnord is used to photographing in Spain and Portugal. When I see this portrait, one of the things I obviously connect with is the notion that I’m familiar with “this sort of face”. But what does “this sort of face” mean and what are its characteristics? About Ali’s portrait, Loring Knoblauch writes: Ali’s big eyes, surrounded by a gaunt, muscular face, lock on and don’t let go, engaging the viewer in an unencumbered and direct stare down. In each case, there is the sense of timelessness, of a figure drawn both from the distant past and the recent present, one side capturing an archetype and another documenting a real life individual. Freud talked about the idea of unheimliche (something that is strangely familiar) in order to describe the sort of experience that, by transgressing the traditional frontiers of aesthetics, presents itself as new, even though it is at the same time unknown – in its totality -, and familiar – in its particularities. The feeling of unheimliche describes a series of phenomena that were supposed to remain hidden, but which in one way or another emerge to the surface, provoking uncertainty in the observer, especially as to the nature (animate or inanimate) of the perceived event. It is also a feeling of restlessness analogous to that of anguish, but different from this, as it is a recurring discomfort. We must content ourselves with selecting those themes of uncanniness which are most prominent, and with seeing whether they too can fairly be traced back to infantile sources. These themes are all concerned with the phenomenon of the ‘double’, which appears in every shape and in every degree of development. Thus we have characters who are to be considered identical because they look alike. This relation is accentuated by mental processes leaping from one of these characters to another – by what we should call telepathy -, so that the one possesses knowledge, feelings and experience in common with the other. Or it is marked by the fact that the subject identifies himself with someone else, so that he is in doubt as to which his self is, or substitutes the extraneous self for his own. In other words, there is a doubling, dividing and interchanging of the self. And finally there is the constant recurrence of the same thing – the repetition of the same features or character-traits or vicissitudes, of the same crimes, or even the same names through several consecutive generations. If we take another class of things, it is easy to see that there, too, it is only this factor of involuntary repetition which surrounds what would otherwise be innocent enough with an uncanny atmosphere, and forces upon us the idea of something fateful and inescapable when otherwise we should have spoken only of ‘chance’. Previous articleby NihilPhotography and psychoanalysis as overlapping fields?